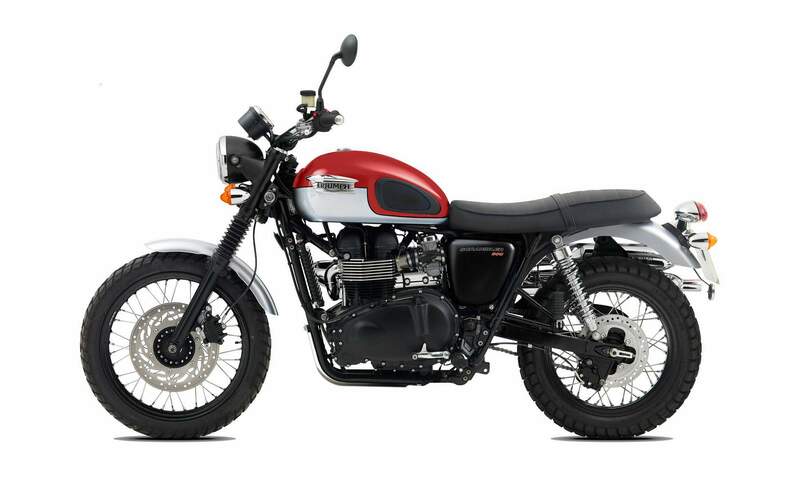 Lean and basic, just as the originals were, the Scrambler reflects the look of 1960s Triumph twins, converted by their owners for off-road riding in deserts and open scrubland where the power of the engines could be used to the full. With its cut down mudguards and black engine finish, the Scrambler has a classic, rebellious style that is loved by so many riders. 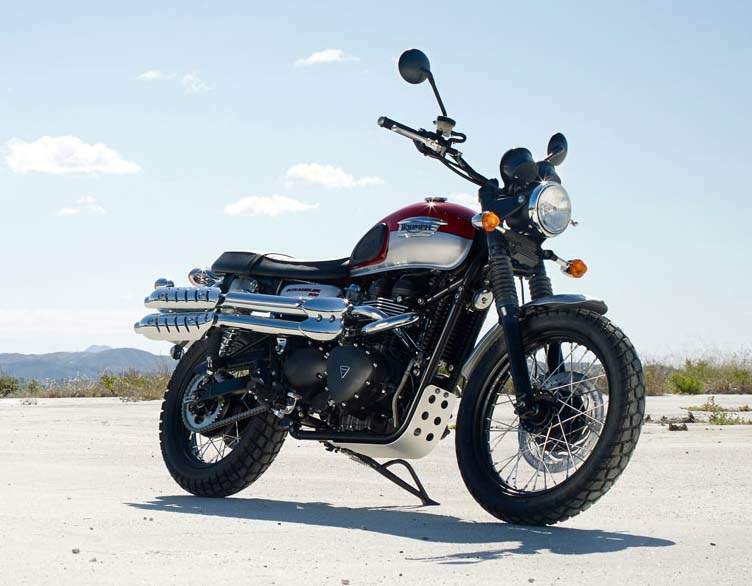 Based on our Bonneville the Scrambler's engine is the classically styled parallel twin, as handsome as those 1960s originals, fitted into a tubular steel cradle frame, just as it should be. High level twin chromed stainless steel exhaust pipes and evocative heat shields are inspired by the 1960s Triumph TR6C Trophy Special. The wheels are wire-spoke with black rims and hubs and wear dual-purpose tyres. The front is 19 inches in diameter to give that authentic off-road look. For the Scrambler we retuned the 865cc eight-valve engine to give you more torque at very low revs. It peaks at a strong 68Nm at 4750rpm but keeps producing useful thrust much lower than that, with 90 per cent of its torque on tap from as low as 2500rpm. The power maximum is 59PS, enough for you to get up to all kinds of fun. Each cylinder has four valves, all operated by double overhead cams making for quieter operation, more accurate valve control and high rev reliability. And the exhaust meets all noise emission regulations but it's free breathing with a note that gives the Scrambler its unique character. So you get a proven and reliable engine, which is the most fuel efficient in our range. We gave the Scrambler a voice of its own with a crankshaft that differs to the Bonnevilles with a 270 degree firing order. So you get an encouraging, off-beat sound from those twinned high level pipes. It even looks as if it comes with old-style carburettors, but weâ€™ve disguised the thoroughly modern fuel injection system, which along with the double overhead cams and contemporary internals makes this a highly fuel efficient, as well as engaging engine. With the exhausts lifted high out of the way it's possible to see the traditional tubular steel, twin cradle frame in all its glory. Classically styled but strong enough to meet modern handling expectations. The engine is bolted in to lend its own stiffness to the frame which creates a ride thatâ€™s light, predictable and completely engaging. Only wire spoke wheels would do for a classic like the Scrambler so that's what we've fitted, now with eye-grabbing black hubs and rims. There's a 19 inch diameter rim at the front to add to the authenticity and style. On those are block-treaded tyres, another nod towards the off-road look but with excellent on-road performance in all conditions. Built to be light and agile yet reassuringly stable when the going gets bumpy. We made the Scrambler forgiving enough to be easy and natural for inexperienced riders but sharp and responsive enough to satisfy even if youâ€™re coming to the Scrambler from larger or sportier machines. The riding position has its roots in off-roading too. We gave the Scrambler high and wide black finished handlebars and footrests raised for better ground clearance. It sits you tall and upright so you are in command either riding around town or cruising along in the country and enjoying the view. It also gives you fine control of the bike when you're hustling it through corners and slipping through traffic because itâ€™s so responsive, obedient and easy to control. Just as desert racers and enduro riders in the 1960s took Triumph twins and personalised them for off-road fun and competition, we started out with the standard Bonneville and modified it to achieve the classic Scrambler look. 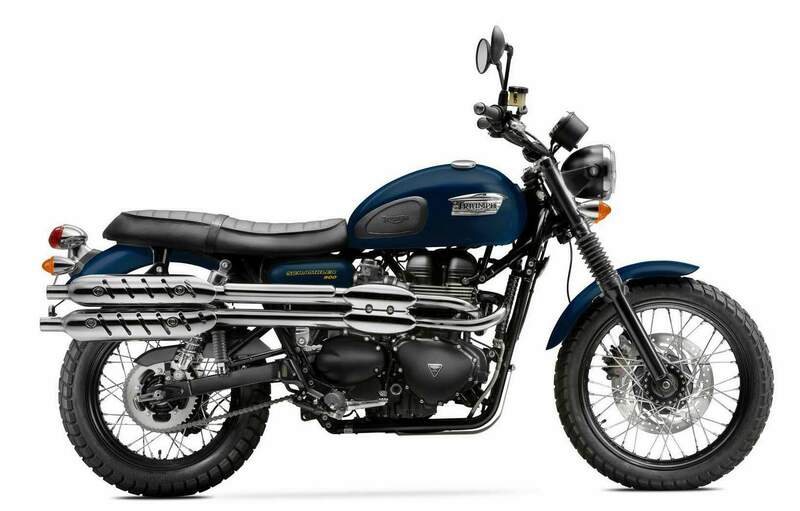 As well as studying closely the original Triumph TR6C Trophy Special from the late 1960s, the bike which inspired the Scrambler's high level exhausts.